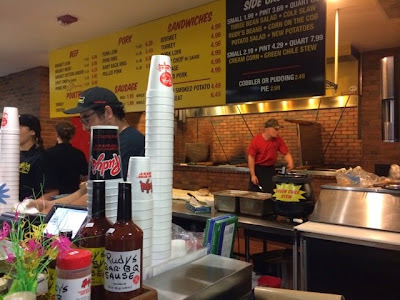 Rudy's, hands down, has the best BRISKET. I can endlessly eat pounds and pounds of the brisket here and I will not be ashamed. I was first introduced to Rudy's on a trip to San Antonio, Texas, where M went to college. I immediately fell in love with their brisket. 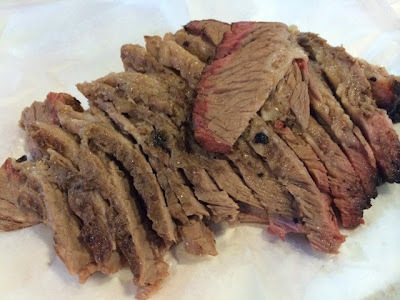 I have not yet found a place in San Diego that has excellent, moist brisket, so if you know of a place, please, please, PLEASE let me know! 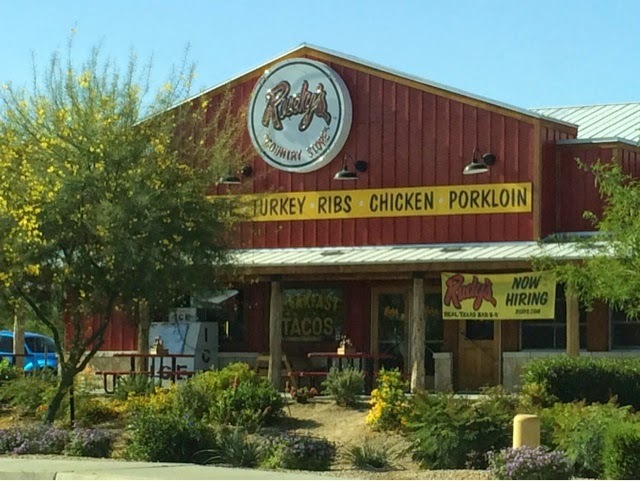 When Rudy's Country Store and Bar B-Q came to Arizona, I knew I had to visit so my taste buds can do a happy dance, once again. The location in Chandler is about 15-20 minutes away from where the in-laws live, so it wasn't too much of a drive for delicious, amazing food. The set up at this location is the same from what the San Antonio location had, except the fact that it is not connected to a gas station (YUP, you heard me right). You have to walk up, fall in line, grab the cold sides from the refrigerator cases, and place your meat order at the register. All the meats are priced by a 1/2 a pound, with the exception of the sausages (whole link price). You can also order sandwiches with any of the BBQ'd meats they offer. I love it. 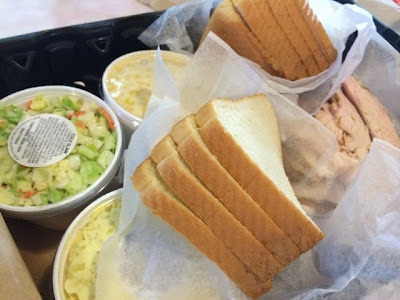 They place all the meats, your sides, and a handful of slices of white (or wheat bread) in a plastic basket and that is your "tray" to bring to the long, family style picnic tables. One pound of baby back ribs ($7.49 for 1/2 lb.) - these are M's mom's favorite, but I found them to be a little tough for my liking. 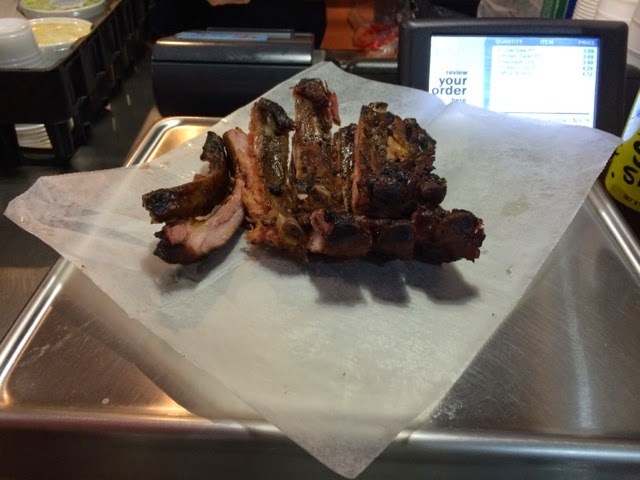 The flavor was there, smoky, but I wished they came off the bone a little more and that I did not have to struggle eating it. 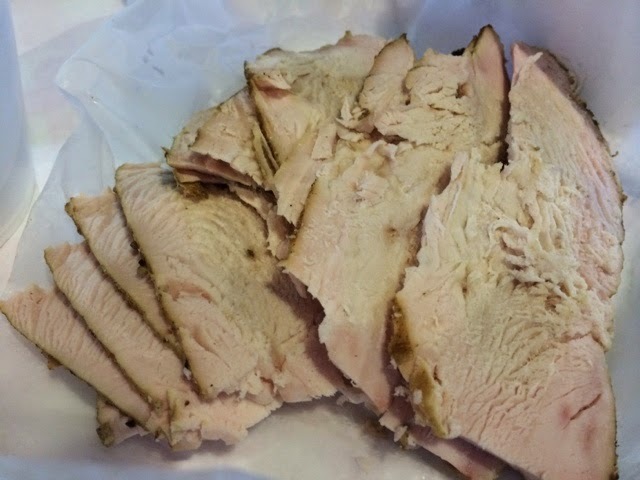 One pound of smoked turkey breast ($6.99 for 1/2 lb.) - this is M's favorite, as it reminds him of his days in Texas. 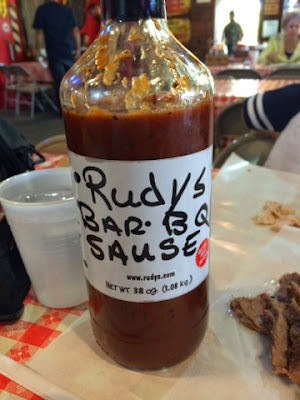 I liked it; it was flavorful and moist, especially when you put Rudy's BBQ sauce on it and sandwiched a large piece between pieces of white bread. Yum! THIS. 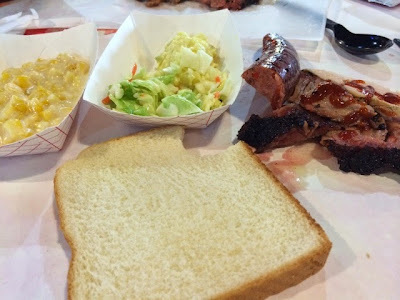 My favorite... one pound of the moist brisket ($7.99 a 1/2 lb.). The brisket comes in lean ($7.49 a 1/2 lb.) and Cutter's Choice ($6.99 a 1/2 lb., which leads me to believe it's whatever the guy/gal cutting wants to give you). We always go for the moist because it absolutely melts in your mouth. For most bites, I did not have to put on any sauce but it was so flavorful on its own. THIS is my second favorite. 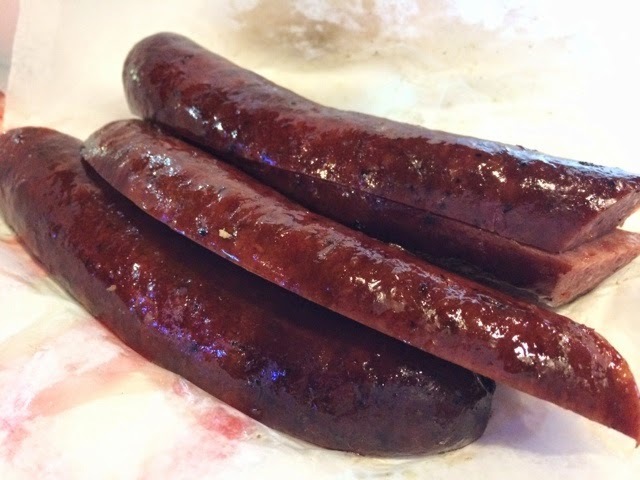 A whole link of the smoked sausage ($4.99). I don't know how they make it but it has the right amount of spices. It has a wonderful snap to it, as well. It is very addictive and it is a must to order the smoked sausage every time I come back. As far as the large sides go (they also serve individual sides for one person), we got the potato salad ($3.69 / pint).... creamy, delicious and perfect. No complaints here. 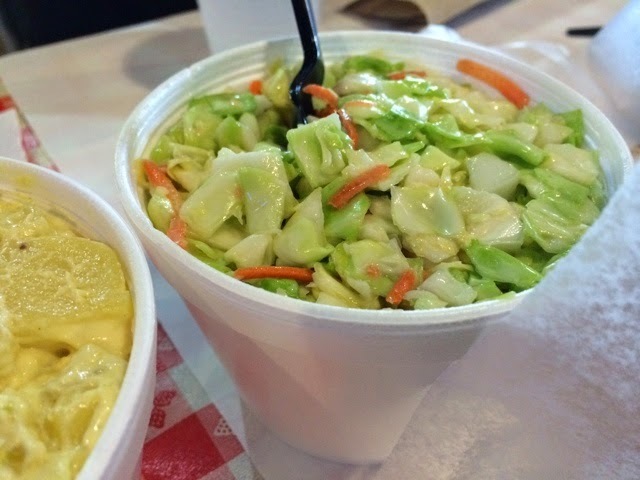 ....the cole slaw ($3.69 / pint). It was okay. 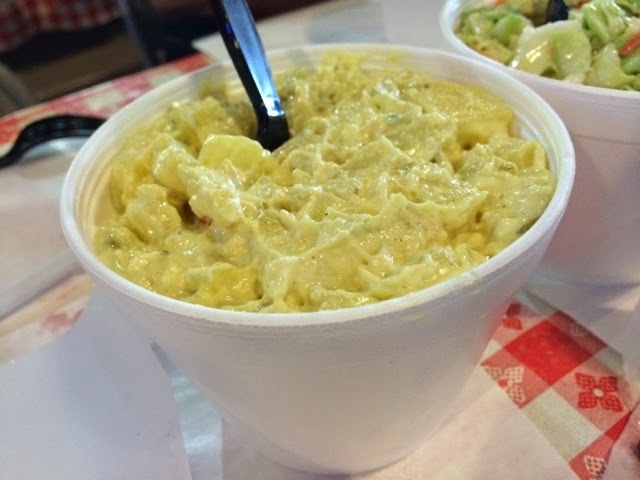 I loved the crunch, but it was really bland and didn't have much "dressing" (mayo/vinegar). ....and my third favorite item here, the CREAMED CORN ($4.29 / pint). I mean, it is what it says it is. 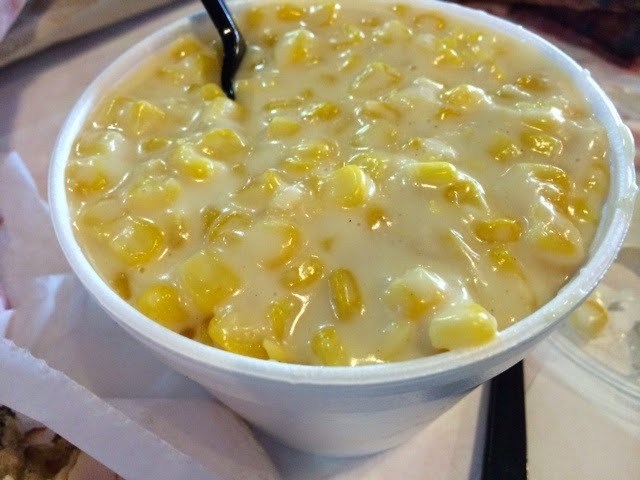 Creamy, sweet corn. The flavor of the corn is apparent and that is all you taste. 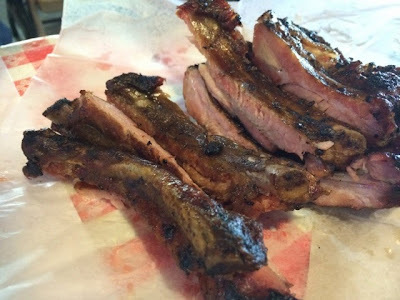 It is exceptional and a wonderful side with the BBQ'd meats. 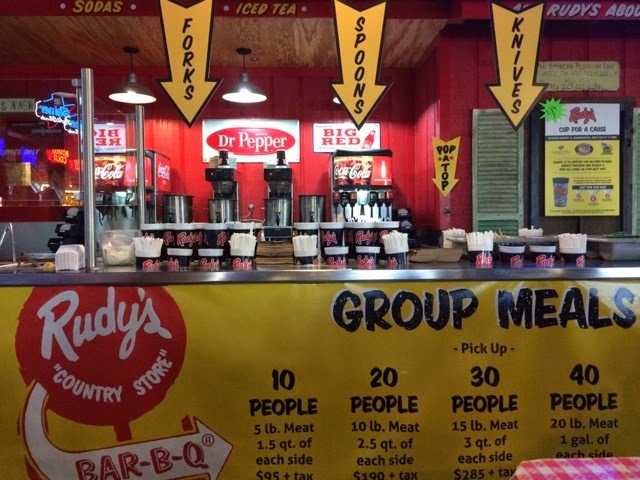 They have bottles of their homemade 'sause' on the tables, their original sauce and their "Sissy" sauce. The original has a little spice to it, but not too much, and the Sissy sauce is pretty mild (hence, the sissy part of the name). I liked them both, but I am partial to the original.